This little card does more than you think. Your Cyclone student ID card is your ticket to dozens of services and discounted programs on and off campus. 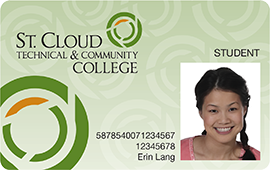 Besides being your official SCTCC student photo ID card, it gives you access to everything from library resources to health services to free bus rides. SCTCC has partnered with U.S. Bank to provide students with Cyclone Card options. Free transportation to and from campus and throughout the St. Cloud area using the Metro Bus Fixed Route system (just swipe your Cyclone ID card on the bus). Visit the St. Cloud Metro Bus website to view bus routes and schedules. How do you get a Cyclone ID card? Cards are available at the Cyclone Card Office (1-215). You’ll need to provide a current class schedule and a picture ID (driver’s license, state ID, or passport). Be prepared to have your picture taken. What if you lose your Cyclone ID card? If your Cyclone ID card is ever lost, damaged or stolen, you can get another one at the Cyclone Card Office. You’ll need a picture ID (driver’s license, state ID or passport). Be prepared to have your picture taken. A $10 replacement fee will be charged if your card has been misused, bent, broken, warped from heat (from a dashboard or clothes dryer), hole punched, or obstructed with stickers. If your Cyclone Card has been activated to as as your U.S. Bank ATM and PIN-based debit card, notify U.S. Bank immediately at 1-800-US-BANKS (872-2657). Learn more about how to care for your card.